Outdoor shuffleboards are enforced and made for more rigorous play. This doesn’t necessarily mean that they are better than some of the more well-made shuffleboard tables. It simply means that they are designed for functionality. Think about it; you’re more likely to be loud and rowdy when in an outdoor setting. 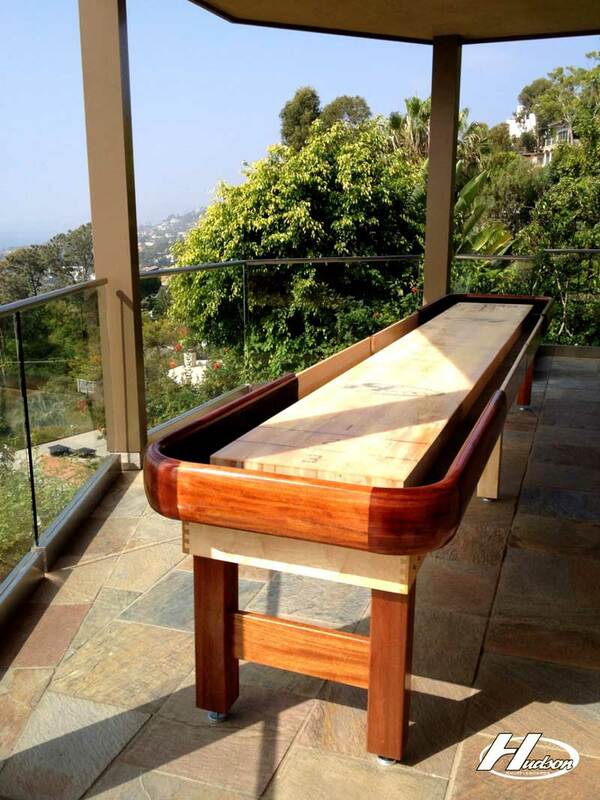 Shuffleboard manufacturers know that things can, well…get a little out of hand so they’ve thought about this when designing shuffleboard tables that are made specifically to be used outside. Outdoor shuffleboard tables are often made of easy to clean materials that you can wipe down. In fact, most of the outdoor shuffleboard tables we carry can be cleaned with a garden hose. This comes in handy. You don’t have to worry about drinks spilling or dust being kicked up. Just a simple effortless rinse down. We recommend that you also wipe it down with a dry cloth when finished to protect from problems with moisture. Outdoor shuffleboard tables are made with special weather-proofing materials. Each manufacturer has their own way of applying this special ingredient. Often times, you can order a normal indoor table and upgrade to the weather-proof model so that you can bring it outside without any worries. They do this by sealing the deck with waterproof fiberglass. Carpet is typically replaced with marine-grade carpeting. This type of carpet is seen on boats and yachts. It’s less inclined to have problems with mold or mildew. 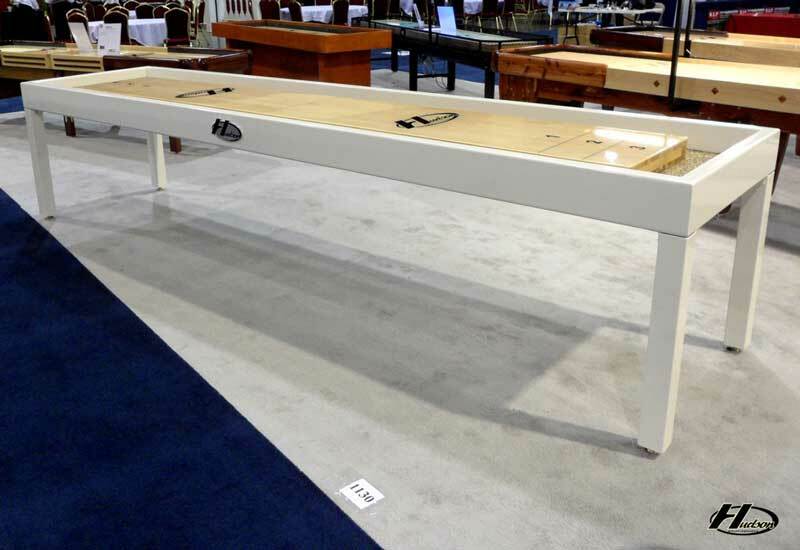 The Metro Shuffleboard table is available with an outdoor upgrade that features an all-weather surface sealed with fiberglass. Some manufacturers advertise weather-proof or weather-resistance tables. There is a difference so make sure you pay attention to the wording. Weather-proof infers that it is immune to outdoor elements. Weather-resistant simply means that it does better than indoor shuffleboard tables being used outdoors. Can I Use My Outdoor Shuffleboard Table Inside? Yes, of course you can! The fact that it’s an outdoor shuffleboard table simply means that it CAN be used outdoors; that doesn’t mean that you necessarily have to. Of course, if you don’t plan on using it outdoors, there’s no point in upgrading to an outdoor table. Save your money for a rainy day! What Size Shuffleboard Table Should I Buy? Jelani Burton is a shuffleboard enthusiast with a competitive fever. He stays up to date with the latest products to keep his game on edge. You can find him sharing new finds on the Shuffleboard Blog. Armed with the right tools and the right know-how, he continues getting better every day.